The highlight of an adventure holiday in Southern Africa is definitely deciding which adventure you should start with. Journey in Style takes you to unforgettable destinations where pristine bushveld wilderness areas, white beaches, azure seas and formidable deserts offer action and spectacular beauty. If you are already a keen surfer or snow boarder then speeding down a huge red sand dune in the middle of nowhere is for you – you can reach speeds of up to 80 km per hour! Your hosts ensure that you only use the best equipment and that you get good training before you head off. Walk slowly up the sand dune, as if walking in honey, until you reach the top – see the amazing view of the Namib Desert, an ancient landscape where some of the largest dunes exist in the world. Then take the plunge – as if taking off from a tall skyscraper, you will get a push and will drop over the edge and downwards, gravity pulling you towards the horizontal sand floor way below you. Stop in Swakopmund to confirm this Namibian adventure as one of the best ever – usually when travellers see the huge Bavarian Church spires and palm trees emerging from thick coastal fog, they know that they have reached this quaint German harbour town of close to the Skeleton Coast.When you stay at Desert Breeze Lodge, with its comfy accommodation on the banks of the Swakop River and the desert as the backdrop, you choose from 12 luxury bungalows, all boasting awesome desert and river views – a great base from which to sand board to your heart’s content. If you want to see magnificent wildlife from the comfort of a stable canoe, then go paddling on the spectacular Okavango River where “adventure” takes on new meaning. Not only will you commune with hippo families and lone crocs basking in the sun, but so too will you watch mothers doing their laundry and children playing, old men simply staring and young men fishing. You will be seated in a traditional mokoro, or dug out canoe, previously made from huge indigenous trees but lately made from fiberglass to be more sustainable. You will oar your way over slowly moving waters and some rapids too. Why don’t you try the four night adventure along the Selinda Canoe Trail with a professional guide who can show you the minute details of a bushveld so vast it can be baffling? After some arm work on the river you do a bit of leg work on the land when you walk a trail with your guide to get up close and personal with real live animals. Guests stay in mobile camps all along the way or why not splash out at Duma Tau Camp, found in the private Linyanti Game Reserve on the western boundary of Botswana’s legendary Chobe National Park? Home to thousands of Kalahari Desert elephants, this Botswana lodge runs entirely on solar energy and has been built from sustainable resources to reduce its ecological impact. Call it an adventure or a relaxing way to really see the African bushveld, but one of the greatest ways to see wildlife is when you are seated atop a huge African elephant! And you can do this in Zambia with a professional guide who will bring the bushveld world around you to life with many stories and interesting snippets about the environment. You will explore the scenic Victoria Falls and Livingstone region, treading slowly and heavily along game paths beside rivers and through magnificent vegetation. Use all your senses to really absorb this experience – and make sure you stay atop your mighty elephant when you see something exciting! While you take photos and enjoy yourself immensely, you will also be contributing to local elephant conservation. Then you won’t feel bad if you treat yourself to a night or two at Livingstone’s Stanley Safari Lodge where the spray of the Victoria Falls can be viewed from every room. Set on a hillock bordering the Victoria Falls National Park, Stanley provides the most splendid setting for honeymoon retreats and family holidays with fun-filled Zambia safaris. The open honeymoon and family suites are designed to welcome the sights and sounds of the African bush. Did you know that the Zambezi River is the fourth longest in Africa and flows through six countries to get to the Indian Ocean? This is an amazing 2 700 kilometers of moving water, and this particular river brims with mysterious stories and historical tales. One of the best ways to explore the river is on a kayak, getting close to rapids and true adventure. If you are a good kayaker, you can tackle what are esteemed to be dangerous rapids, as long as you don life jacket and helmet to get you there safely. If you are still learning, a professional kayaker will go with you to explore these powerful waters. One of the most popular areas to Kayak is Boiling Point, an aptly named rapid where a huge gorge makes for wonderful viewing in nature, and photography. Those who tackle this gorge need to be a minimum of 15 years old though! So base yourself in a wonderful lodge such as Tongabezi which is built on the steep banks of the Zambezi River, a romantic and exclusive retreat providing the very best in accommodation and Livingstone safaris. Tongabezi is the first river lodge to be built on the Zambian side of the majestic Victoria Falls! 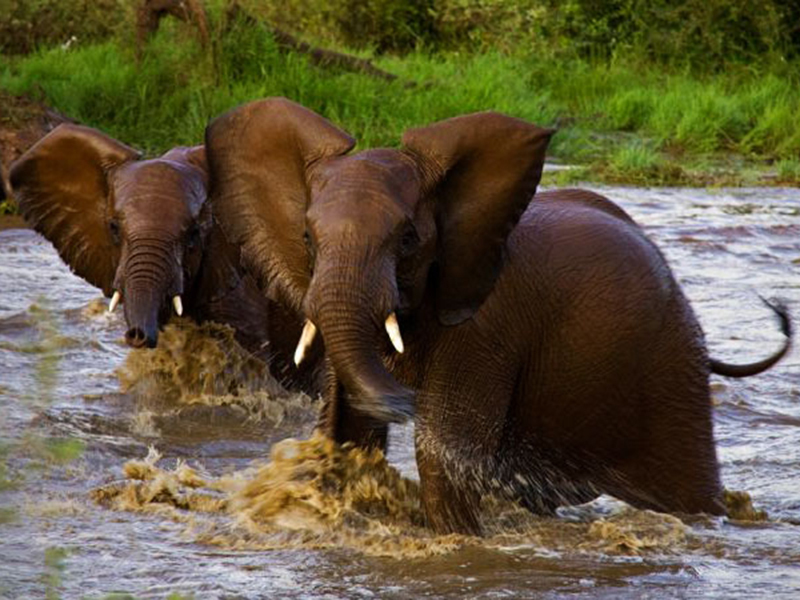 If taking on “boiling” rapids is too much for you, then maybe a nine day safari into Tanzania to see the annual Wildebeest migration will suit you? Immerse yourself in the African bushveld where only wildlife and its pristine habitat dominate – a sight for sore eyes, a photographer’s paradise. When you land at Kilimanjaro, you will head off to Arusha for the night. Next morning journey in style to the Northern Serengeti Serengeti – it is amazing to think that the National Park boasts the highest concentration of large mammals on the planet! This includes the largest concentration of lions in the world – 2,500 lions! Famed for its annual Great Wildebeest Migration, when some 6 million hooves pound the open plains, as more than 200,000 zebra and 300,000 Thomson’s gazelle join the wildebeest’s trek for fresh grazing, this World Heritage Site has recently been proclaimed a 7th World Wonder. The Serengeti Migration Camp is one of the best places to see the greatest wildlife spectacle on earth – the Serengeti Wildebeest migration! Stay in one of 20 luxurious stone, wood and canvas chalets raised on platforms to absorb the breath-taking views over the wilderness. You will spend your entire stay game viewing in 4×4 vehicles and wining and dining in style. Not to be missed if you are a wildlife lover who likes comfy accommodation! So, the five best adventure travel options in Africa can be your part of your personal journey in style. Choosing between luxury accommodation in the Serengeti and a nine day wildebeest migration event, kayaking in the energetic waters of the Zambezi, enjoying the bush from the back of a graceful elephant, canoeing down the Okavango River or sand boarding in Namibia is difficult but one of these will suit you, we are sure. Book your adventure today with Journey in Style and send us the photos!